The Reference Frame: Illegal migrants apparently given prepaid Mastercard debit cards by Soros, EU, U.N. Illegal migrants apparently given prepaid Mastercard debit cards by Soros, EU, U.N. In several separate but analogous programs. Soros' projects are still being negotiated. An hour ago, I was stunned by articles in the Czech media that were sent to me. What is this Mastercard? Note that it is decorated by symbols of Mastercard, the European Union, and a branch of the United Nations. 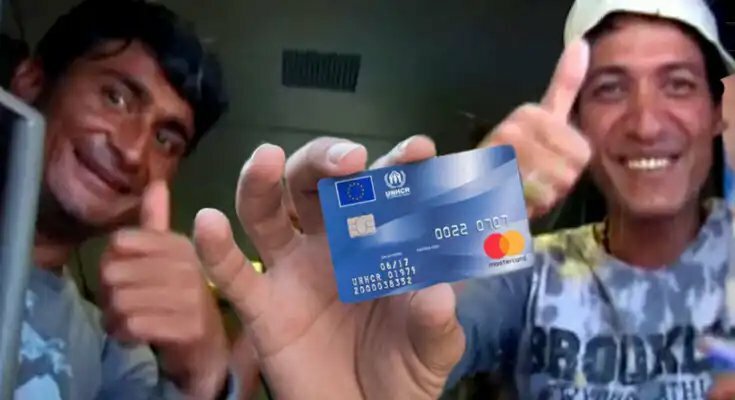 It's a prepaid debit card that was apparently found in the pockets of illegal migrants that are flowing to the territory of the European Union through the Balkan route that someone is apparently trying to revive. According to Sputnik (original from The Hungary Journal) and other sources, the ruling parties in Hungary – Fidesz and the Christian Democratic People's Party – demand an explanation of these debit cards from the European Commission. The Western press seems to be completely hiding this story – or am I overlooking something? This story doesn't seem to be a hoax. One reason is that you can find a January 2017 Reuters story saying that Soros, Mastercard planned to partner to aid migrants and refugees. I must have missed that story last year – or I have forgotten about it. The preparations were shocking enough but now they apparently became a reality. Not only that. Aside from Mastercard and George Soros, the European Union and the Islamic fundamentalist "human rights" body within the United Nations have embraced that campaign as their own. None of the European citizens were told anything about that project. I am simply not getting how it's possible that the police and intelligence services in many countries aren't rapidly arresting the people who have actively participated in this apparent scheme yet. It seems like an unquestionable case of sponsoring of organized crime and terrorism, money laundering, and a treason and the people behind this scheme deserve death penalty or life in prison if the death penalty was canceled in their homelands. On top of that, some sources indicate that Soros actually isn't donating the money – he expects the steal the money back from the welfare programs with a hefty interest. This crime is called the damaging of the financial interests of the European Union. Lots of people who have claimed that George Soros is funding – and the EU and the U.N. are collaborating in – the mass relocation of exotic migrants into the European continent in order to change the basic identity of the continent (the EU apparently prefers such a new colorful population because it's not attached to any European nation and is too dumb to be Euroskeptical) were labeled conspiracy theorists. But the data indicate that these conspiracy theories have turned to conspiracy facts. If we allow these organized criminals to do these incredible things, what will be next? Will the invaders be also given weapons for their invasion to be even smoother? Will we passively watch what is going on? Instructions showing it's a prepaid Mastercard without a name but with a PIN... Reports say that tens of thousands of such cards were distributed.